The Llanos Orientales, as large as 16-17 million ha and roughly about one quarter of Colombia's territory, are seen by some as a possible solution for the large amounts of landless small farmers (campesinos) who became IDPs during Colombia's domestic conflict. Possibly this solution is part of the (preliminary) Agrarian Reform Agreement that was recently reached as a first result of the FARC peace negotiations that are still continuing in Havana, Cuba. The Llanos Orientales, including the states (departmentos) of Arauca, Casanare, Meta and Vichada, is still - for the greater part - unused land, existing of savannas with plenty of rainfall and sunshine and an oxisol/ultisol soil type. It has been demonstrated that the physical conditions of the soil are usually best under permanent grassland (or forest). When the soil is cultivated, these conditions usually deteriorate at a rate dependent of climate, soil texture and bad management. Significant negative effects have been found of continued cropping on the physical properties of soils in the Llanos. The Zonas de Reserva Campesina (ZRC) is a legal figure in Colombia that is constituted in Law 160 of 1994. This law is a result of the pressure of the enormous movement of settler peasants at the time. The law created a legal way (the ZRC) to allow access of the rural peasants to the property of their settled lands. If you don't have legal titles for the small peace of land that you have farmed for years or decades as a peasant, then you can be forced to leave by the (para-)military. This has happened and is happening on a large scale in Colombia, resulting in 6 million IDP's over the years. Law 160 also defined another important figure: the Unidad Agrícola Familiar – UAF (Peasant Farmer Unity), a measure of a fair amount of area that allows suitable economic living conditions for a peasant family. The definition of UAF sought the abolishment of land concentration and the establishment of a new class of landowners. Existing ZRCs total up to about 830,000 hectares today. Existing and requested hectares of ZRCs add up to 2.5 million hectares, while one of the agenda-items in the FARC-EP peace talks is to expand this to 9.5 million hectares. Since 2010 the struggle of the Colombian peasant communities has exacerbated. The government’s negligence to attend the application of settler peasants who want to legalize their settlements and create ZRCs, forced rural workers of all regions to get organized and mobilized. They created the Asociación Nacional de Zonas de Reserva Campesina – ANZORC (National Association of ZRC), which groups the constituted ZRCs, the ZRC on the way of being constituted (Losada-Guayabero, Güejar, Sumapaz, Montes de María, Perla Amazónica), and ZRCs de facto, founded in strong peasant resistance and self-determination that reclaims its right to become ZRC. From 1994 to today, a lot of reforms and official silences mutilated the original spirit of Law 160. In spite of the delimitation and creation of five new ZRCs (Cabrera, Sur de Bolívar, Calamar, Pato-Balsillas, Río Cimitarra) with approximately 70,000 hectares, a lot of initiatives for new ZRCs have been blocked by the State bureaucracy. Based on questionable Military Intelligence reports the state insists that the idea of the ZRC comes from a plan of the communist guerrilla to create “Independent Republics” on the countryside. Clearly the neo-liberal Colombian government is still afraid for a socialist Bolivarian-like revolution, as happened in Venezuela. However, by not addressing the large social inequality of the Colombian people for decades, chances are not diminishing that such a Bolivarian revolution might happen one day. On the other hand there is a more valid economic argument not to support ZRCs/UAFs on a large scale. It has been proved repeatedly that large scale high-tech agriculture can produce much cheaper and higher quality products than small scale agriculture ever can. This means that small peasants can not survive in the long run, because their products become too expensive for the local and International markets. New WTO Trade agreements for agricultural products will only speed up the process of small farmers that can not survive and end up in the slums of the big cities. The solution is to support the creation of agricultural cooperatives and support these with education, coaching, training and knowledge. While there is plenty of arable land in Colombia especially in the Llanos Orientales, the Colombian government seems to have chosen to ignore the problem so far. 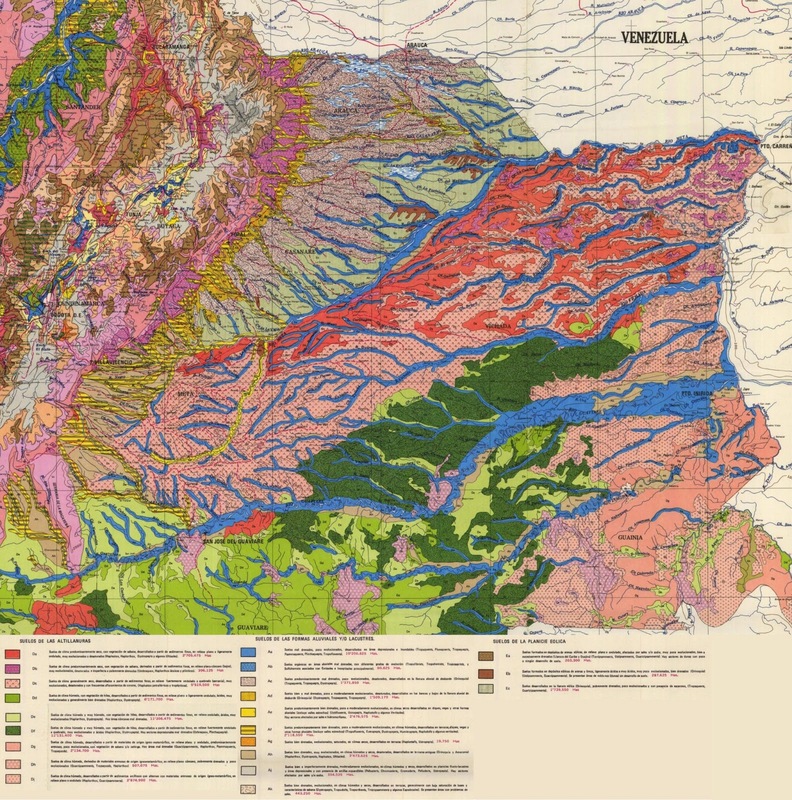 The western watersheds in the Orinoco basin, south of the Meta River in Colombia, have deep infertile Oxisols (Ferralsols) and Ultisols (Nitosols). North of the Meta River and west of the Orinoco River the soils are more fertile Alfisols (Luvisols) with some Mollisols (Phaeozems) and Vertisols on the more clayey sediments. The Oxisols and Ultisols of the savannas of Colombia and their susceptibility to sealing, compaction, and erosion when subjected to horizontal tillage can result in negative effects on sustainable productivity of crop-livestock systems. However, two crop yields per year are possible, when very good (professional) care is taken of the soil, like the cerrado in Brazil. This means vertical tillage instead of conventional horizontal tillage, retaining soil organic matter, adding biochar and limestone to the soil, and correct N,P,K fertilizing. Oxisols are the most intensively weathered soils, consisting largely of mixtures of quartz, kaolinite, oxides of iron and aluminum, and some organic matter. Many Oxisols contain little silt because the silt sized mineral particles have essentially weathered leaving a clay fraction composed mainly of oxidic clays plus kaolinite and varying amount of sand. You'll find plinthite in many places. It forms a continuous layer within 30 centimeters of the soil surface and is water saturated at this depth sometime during the year. Plinthite is an iron-rich material that forms some distance below the soil surface. When plinthite is exposed to drying, it dries irreversibly, forming a rock like material called “hard-pan”, ironstone or laterite. Oxisols are characterized by a very low amount of exchangeable nutrient elements, very low content of weatherable minerals, high aluminum saturation of the cation exchange capacity, and moderate acidity. Generally, Oxisols represent the most naturally infertile soils for agriculture. Some are, however, the world’s most productive soils because of intensive management. Forests grow vigorously on Oxisols in the humid tropics because water is generally available and plant nutrients are efficiently cycled and deeply penetrating roots absorb nutrients from soil layers that are much less weathered and more fertile than the higher A and B horizons in the soil. Ultisol is the ultimate product of continuous weathering of minerals in a humid, temperate climate without new soil formation via glaciation. A study that was published in Applied Geography 2012, presents a detailed spatial, quantitative assessment of the land use/cover changes in the savanna region of Llanos Orientales during the period 1987 to 2007. The results showed that by 1987, 10% of the area of the study area had experienced some kind of change, increasing to 23% by 2007. The necessity of increasing livestock production caused the transformation from natural to exotic pastures in the 1970s. During the 1980s and 1990s rice plantations were established in the southwest area and later on in the northwest of the study area. By the end of the 1990s, palm oil plantations had expanded, petroleum exploitation and the growing of illicit crops had increased. Politically, the region has been transformed from a neglected frontier into a zone of primary national significance and high hopes have been placed on the region to provide future economic growth. Phosphorus (P) is an important primary nutrient for every plant. It is needed for the conversion of light energy to chemical energy during photosynthesis. Other primary nutrients are Nitrogen and Potassium. Nitrogen (N) is an essential component of all proteins. Nitrogen deficiency most often results in stunted growth, slow growth, and chlorosis. Potassium (K) regulates the opening and closing of the stomata by a potassium ion pump. Since stomata are important in water regulation, potassium reduces water loss from the leaves and increases drought tolerance. The highly weathered acidic Oxisols and Ultisols account for more than 70% of P-deficient soils in the tropics, of which nearly 50% are found in tropical America. In the tropics iron and aluminum oxides in Oxisols and Ultisols cause strong sorption of soluble fertilizer P. However this can be overcome. Luckily Phosphate mines are abundantly available in Colombia (and Venezuela). 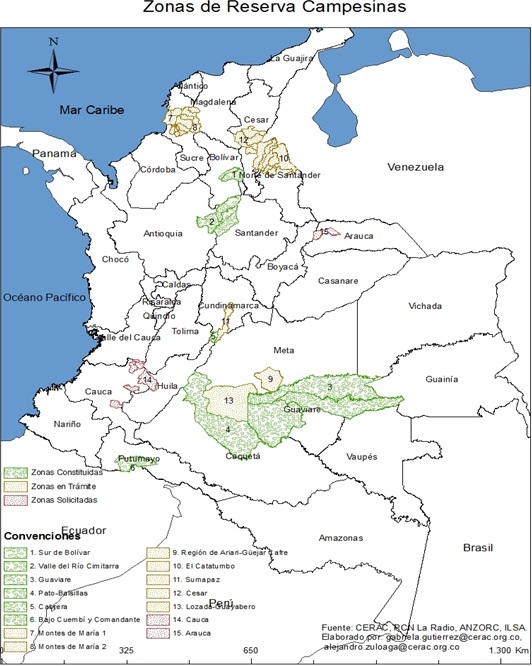 Map of Phosphate Mines in Colombia. However, Phosphorus (P) availability for plant growth on highly weathered and P-deficient tropical soils may depend more on biologically mediated organic P turnover processes than on the release of adsorbed inorganic P.
Application of organic fertilizers and biochar increase nutrient stocks in the rooting zone of crops, reduce nutrient leaching and thus improve crop production on acid and highly weathered tropical soils like oxisols. Terra Preta de Indio or Amazonian Dark Earths (ADE) as found in the Amazonia region and created by pre-Colombian civilisations have proved to be very fertile - even today - because of their charcoal contents. In strongly weathered tropical soils, soil organic matter (SOM) plays a major role in soil productivity because it represents the dominant reservoir of plant nutrients such as N, P, and S. Generally, SOM contains 95% or more of the total N and S, and between 20 and 75% of the P in surface soils. Thus, longterm intensive land use where SOM stocks are depleted, is not sustainable without nutrient inputs of expensive mineral fertilizers. On soils with lownutrient retention capacity the strong tropical rains easily leach available and mobile nutrients, such as inorganic N fertilizers, rapidly into the subsoil where they are unavailable for most crops. Plant roots alone may be incapable of taking up phosphate ions that are demineralized in acidic soils like oxisols. The mycelium of the mycorrhizal fungus can, however, access these phosphorus sources, and make them available to the plants they colonize. Therefore after harvest the roots should be left in the soil to rot and become SOM and preserve the fungi. The leaves and the stalks of each yield should be charred and harrowed into the soil. However, the necessasity of the crop residu to maintain the soil's fertility, could compete - in time - with "second-generation" Cellulosic-Biomass-to-Ethanol technology, like Proesa, C5 Yeast Company and Dupont's solution, or Agriwaste-to-Bioplastics technology. 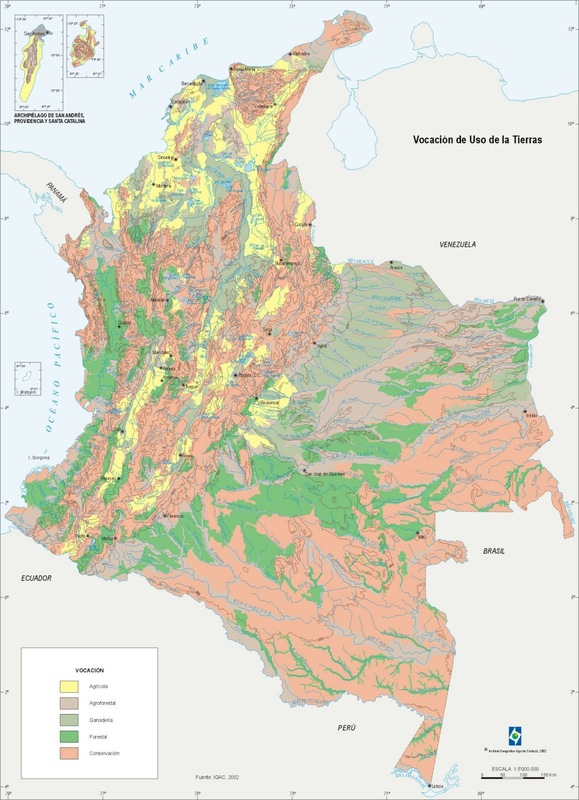 Most of the acid soils of the Llanos Orientales of Colombia and Venezuela are high in exchangeable aluminum (Al). In absence of soil organic matter Aluminum saturation can be higher than 80 percent in these soils, which has a toxic effect on most crops. High amounts of calcite or dolomite limestone 1500 kg/ha are required to reduce the Al saturation to less than 20 percent. Currently only 5% of this savanna ecosystem is administrated as a National Protected Area. They contain over 55% of the country's wetlands, 40% of the subterraneous water of the country, 46% and 40% of Colombian fish and bird species. Additionally, they form important corridors for many species of mammals and reptiles, such as the jaguar, which migrate between the Amazon, Guiana and Andes regions. Taking into account the many development projects which are planned for the future, the Llanos Orientales of Colombia is likely to be one of the most threatened ecosystems in Colombia impacting on biodiversity and hydrological functioning. 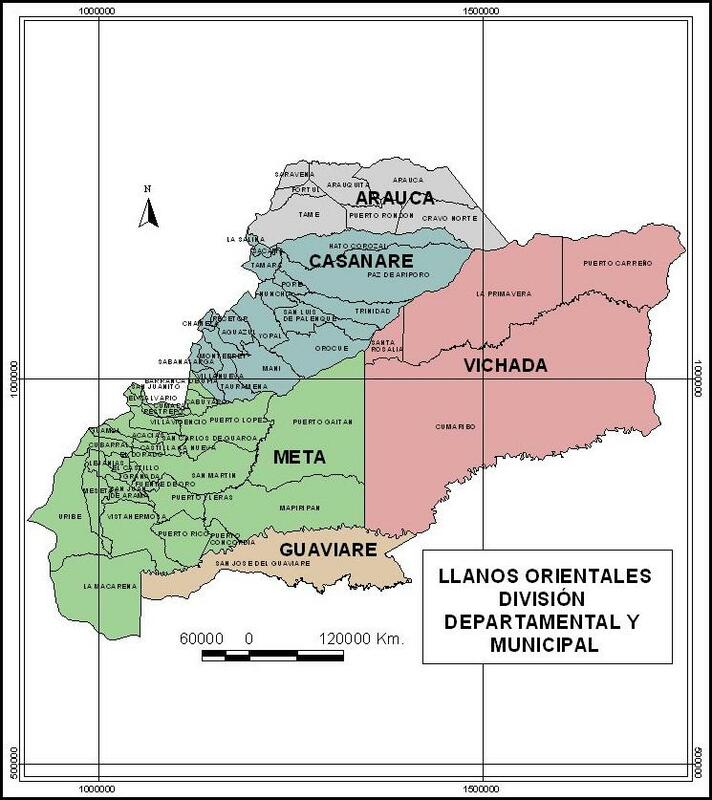 If the Llanos Orientales is indeed part of a land distribution solution for IDPs in the context of the agrarian agreement of the FARC peace process, president Santos will kill three birds with one stone. He will solve part of the IDP problem, give an extra boost for the agrarian development of the Llanos region and because of peace with the FARC he will be able to attract more foreign capital for the region. However there will be challenges as well. There are overlaps between mining & oil areas, protected ecological areas and indigenous territories. Historically (large) plots of land are in use without title (...grabbed). Ranchers just started using the abundant grassland for cattle breeding and - in time - started seeding more productive grass species and thus claiming the land. If not handled carefully this all could easily lead to new (land) conflict zones. As explained above most of the soil of the Llanos can only be productive in a sustainable way if it is professionally well managed. This is hard to realize by an individual campesino, because of lack of knowledge and equipment. We've seen many crop substitution programs - whereby coca cultivation is replaced by coffee, banana, pineapple, palm heart, and other crops fail in the past, because of lack of knowledge and equipment. However Campesino Cooperatives that are coached, trained and educated by professionals could succeed. Parts of the Llanos get flooded for a few months every year, so drainage and levees should be established in new agrarian zones. A good road infrastructure is needed as well of course.